Two things were going to be key for this Barcelona race day - getting a good start off the line, and making the right strategy calls at the right time. 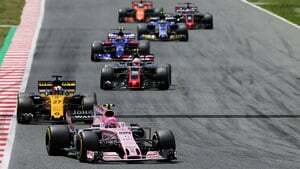 And it was those two things that dictated the winner of the race, although there were a few incidents and retirements, and a couple of penalties that also helped move the action along. If you want to know how Spain's podium came together, then read on for lap by lap coverage of the action at the Circuit de Catalunya, including statistics, quotes and much more. Lewis Hamilton wins the race after good strategy call under virtual safety car. Vettel swept into the lead off the line but dropped back for second. Ricciardo finished a distant third. On lap 1, Bottas nudged Räikkönen who clouted Verstappen, knocking the Ferrari and Red Bull out of the race. Bottas retires with power unit failure. Vandoorne collides with Massa and ends up in the gravel for another McLaren DNF. Hello F1 friends, how have you been? Are you all wide awake and raring to go for the Spanish Grand Prix today? The pit lane has opened at the Circuit de Catalunya, and the cars are revving up and making their way out for a lap to the grid. Lots of practice starts in evidence, no doubt drivers feeling the pressure as overtaking is at a premium in Spain so the start will be crucial. McLaren are still dominating headlines but they have mixed fortunes this weekend so far. Stoffel Vandoorne qualified second from last but has taken a 10 place power unit grid drop anyway, so will be at the back of the field. Fernando Alonso, however, spurred on by the home crowd, managed to qualify not only inside the top ten, but up in seventh place. Incredible! The tyres are of some concern, as Pirelli have opted to bring the hard compound here, despite the fact that durability has been higher than expected on even the softest of compounds. The organisers have opted to extend the length of the DRS zones here this weekend, hoping to improve overtaking opportunities. Daniil Kvyat, starting 19th on the grid: "It’s a long race and anything can happen still. Sometimes strange things can happen on this track. I think we will see a lot of interesting things today. [The car] can sometimes come alive in the race, you never know, it’s a bit unpredictable this weekend." Stoffel Vandoorne, starting 20th on the grid: "It’s been a difficult start of the season, we knew that. Hopefully today with the strategy we can do something different. It’s not an easy one stop as everyone thought." Max Verstappen, third row of the grid: "Nice temperature, so good. I’m not sure if we can really challenge [Mercedes and Ferrari] on pure pace but I think if we can have a good start… it’s difficult to overtake on this track. I think we can defend, just a shame the DRS zone is a bit longer, but I think we can." Drivers have made their way to the front of the grid to respectfully await the national anthem. Tweet from @MercedesAMGF1: The boss, Dr. Zetsche, is with us this weekend! Ferrari have introduced a new start system for their drivers, but Ted News, it looks like Vettel has got the new system and Kimi has not. Paddy Lowe of Williams aims to get both drivers in the top ten today: "Very tough for Lance to get points today, but there are options to allow him that. Depends what happens in front, obviously. Felipe we’d like to be pushing up towards seventh, sixth place if we can." Not much chance of rain today, less than 20%, but it's looking quite windy out there and the gusting conditions caught out a lot of drivers during Friday practice. Most of the drivers are starting on the yellow soft tyres, with just Kvyat and Vandoorne, plus Palmer in 17th, starting on the mediums. The grid clears for the formation lap. Lewis Hamilton leads the field away for the formation lap, it's nice and bright there in Barcelona. First lap action all over the place. Sebastian Vettel has grabbed the lead of the race. Verstappen and Räikkönen back at the rear of the field. Räikkönen has a tyre pointing in totally the wrong direction, he'll be heading for the pit lane. Felipe Massa has a puncture and he'll have to dive in for an early stop as well. Turn 1 incidents under investigation. Räikkönen hasn't managed to make it back to the pit lane, he's stopped at the side of the track. Verstappen is in the pits but it doesn't look so good for the Red Bull driver either. Palmer and Kvyat also pitted during the first few laps of chaos. Out front, Vettel has hauled out a 2.6 second lead already, and is setting the fastest lap of the race so far. Turn 1 incident involving M Verstappen and K Räikkönen - no action warranted. Massa had a front right puncture and a front wing change, so he's back out and running in 18th, having dropped nine places. Turn 2 incident involving F Massa and F Alonso noted - forcing another driver off the track. Fernando Alonso has dropped to 11th, but he's chasing the Haas of Grosjean for that last points position. Right, replays of the start are go. Vettel just got off the line really cleanly and was leading into the first corner. Bottas on the inside nudged Räikkönen into Verstappen, it was a minimal amount of contact for those two but they then had to go over the hefty kerbs. On board with Kimi, actually it looked like a soft nudge with Bottas but a really hard hit with the Red Bull. "Somebody hit me from behind and broke my steering," the Finn reported. We heard the replay of Alonso complaining that Massa had bumped him off track, but it seems like Massa came off worse there anyway. Hamilton is maintaining the gap to Vettel but tells the pit wall that he's really struggling to keep up with the guy in front. Team radio to Alonso: "How much do you think you're being held up?" Unusual position for the McLaren to be in! Valtteri Bottas has been instructed to pick the pace up. Tweet from @RenaultSportF1: Lap 10 - Nico is P7, looking to go play with his former team, and Jolyon has rejoined in P17 after his pitstop. Turn 1 incident involving Alonso and Massa - no action warranted. With those early stops for Palmer and Kvyat, Stoffel Vandoorne is the only driver currently running on the medium compounds. All else on softs. Turn 1 incident involving Räikkönen, Verstappen and Bottas under investigation - causing a collision. Force India are doing a brilliant job, running fifth and sixth at the moment, Pérez four seconds ahead of Ocon. Nico Hülkenberg was the biggest winner in the kerfuffle at the beginning, he's currently up six places running in seventh. In the other Renault, Jolyon Palmer is told to pick up the pace. He's running 16th with one stop under his belt. Fernando Alonso comes in to the pits for his first stop of the afternoon, another set of softs goes on that McLaren. Team radio from Hamilton: "What's going on guys?" "Okay Lewis, we're just keeping an eye on our pit window. Just keep doing what you're doing, keep that gap as small as possible, you're doing a great job." Magnussen and Sainz hustle into the pit lane at the same time. Both cars are released at the same time and Carlos takes to the grass to try and get past the Haas, but has to stick behind for now. "He pushed me off, he pushed me off," Sainz complains when we all saw that Magnussen was just trundling down the pit exit as normal. Turn 1 incident involving Räikkönen, Verstappen and Bottas under investigation - no action warranted. Pit exit incident involving Kevin Magnussen and Carlos Sainz noted. Sebastian Vettel pits which puts Hamilton in the lead of the race, and the Mercedes is instructed to make the most of this opportunity. Tweet from @pirellisport: We’re seeing race leader into the pits, along with a few others. All onto softs. Slightly slow stop for #Seb5? Hamilton in next? Vettel sets the fastest lap of the race, he's currently in third but the first of the runners to have stopped. Kvyat muscles his way past Alonso, who really just had to keep out of the bright blue Toro Rosso's way. Kimi Räikkönen: "It all started when I got hit on the right rear corner, my car jumped a little bit and you can’t control it after that. Then we got together with Max. What can you do? When you are out of the race in the first corner, there are not many positives." Pit exit incident involving Kevin Magnussen and Carlos Sainz under investigation... and then no further action warranted. Hamilton has an 11 second lead at the moment, but he sounds really ragged in the car as he asks what the plan is of his engineer. Vandoorne dips to the outside of Jolyon Palmer in the Renault, to overtake for 16th place. Good move even for such a disappointing position. Replays of a Force India pit stop show they had a real struggle to get the front right tyre off, which delayed Sergio Pérez considerably. Lewis Hamilton pits from the lead of the race, leaving Valtteri Bottas to move into P1. Super quick stop from Mercedes and they've put Hamilton on the medium compound, which is a different strategy from those around him. Having said that, Ricciardo in fourth (just behind Hamilton) is also on the white stripes. Bottas in the lead, and Wehrlein running in sixth, are the only drivers not to have stopped yet. Tweet from @pirellisport: Well, this is a bit different. @LewisHamilton onto the medium. Might be a short stint, then onto soft until the end. Vettel is now chasing Bottas, hoping to regain his lead. There's just half a second between them. Of course, if Bottas can hold up the Ferrari, that works in Hamilton's favour. Vettel jinks to the side and pulls alongside Bottas down the home straight but he has to back off into the first corner. Bottas locks up which allows Vettel to close up even further but there's still no opportunity yet. Vettel weaves this way and that down the home straight, wobbles onto the grass to kick up a puff of dust, but finally gets the inside line and makes the move. First place for Sebastian once more, but Hamilton has closed up significantly. Hamilton sweeps past Bottas on the next lap, it's about 4 seconds between the first two cars now. Bottas, having done his bit for the team in every way, comes in for his own pit stop. Tweet from @ForceIndiaF1: 26 laps in, it's still P5 and P6 for Checo and Esteban. Comfortable gaps on their rivals, with WEH 5s behind. Still unclear whether the race leaders will opt for two or three stop strategies here, but Vettel is on a strategy all of his own at the moment - the only one of the top four to be currently on softs. Marcus Ericsson dives to the inside of Fernando Alonso's McLaren into turn one, to take 13th place off the Spaniard. Calm moment of racing now, as we wait to see who will do what next. Team radio to Lewis Hamilton: "We need to be matching Vettel's time, and then closing the gap." "I don't think I can close the gap on these tyres, guys." Fernando Alonso pits for the second time of the afternoon. That has dropped him down to 17th place. Collision between Felipe Massa and Stoffel Vandoorne and the McLaren is off into the gravel, out of the race. Yellow flags and virtual safety car deployed. Bizarre incident there, Massa was easily alongside the McLaren and they just bumped wheels in the corner. Plenty of drivers taking the opportunity to pit under this virtual safety car. With so many cars pitting, we're now left with the top four and, of course, Pascal Wehrlein who took the opportunity to make his first stop, with just one stop under their belts. Turn 1 incident involving S Vandoorne and F Massa under investigation. Pit entry incident involving Pascal Wehrlein under investigation. The McLaren is being recovered, marshals leading the car away on the tractor. Replays show Vandoorne apologising to the team over the radio as he ditched into the gravel. Mercedes mechanics dash out into the pit lane. It's Lewis Hamilton that comes into the pit lane and a fresh set of soft tyres go on the Mercedes. Sebastian Vettel heads into the pit lane, that's a dodgy strategy call for Ferrari as Mercedes lost far less time under the VSC. Vettel rejoins directly alongside Hamilton, they are side by side into the first corner, Hamilton is pushed a little wide, and Vettel keeps the position... just! Hamilton is having another go on the Ferrari, he's so close behind it can only be a matter of time before another opportunity presents itself. Yellow flags for Valtteri Bottas, he's parked up off track, smoking pouring from the engine. The pair are on different tyres now, Vettel on the harder compound, Hamilton on the softer. Daniel Ricciardo sets the fastest lap of the race so far - 1:23.686. Meanwhile, the front two are navigating their way through back marker traffic which is keeping Hamilton behind, but he's looking feisty. Ricciardo in a lonely third right now, the gap to the front pair is over 50 seconds, but he's got tow Force Indias about 10 seconds behind him. Hamilton asks his engineer to leave him to it again, but he does say please, so that's something. Carlos, however, has no pleases and thank yous. "Okay, leave me alone, now." Hamilton finally has the advantage into the first corner, he drags his way past the Ferrari and regains his P1 position. Turn 1 incident between Lewis Hamilton and Sebastian Vettel noted - no investigation necessary. Team radio from Sebastian Vettel: "No chance, no chance. Like a train, like a train." "Don't give up, he will struggle with the tyres." Daniil Kvyat overtakes Romain Grosjean for P10, the last of the points positions. Not bad considering he started in 19th. Hamilton asks the pit wall what the plan is now, whether to pull the gap or cool the tyres, as his rears are already showing signs of wear. 5 second time penalty for Pascal Wehrlein - failure to stay to the right of the pit entry bollard. "It's not easy to pull away from him," Hamilton says, and he's right. The gap is still just 1.7 seconds between him and Vettel. All but the top four drivers have been lapped now. The blue flags are working overtime today. Another quiet moment of the race. Ferrari pondering whether to go to Plan C, which is rumoured to be a three stop. He has plenty of gap to Ricciardo in third, but not a lot of time left to make the gap. Just three cars on the lead lap now. Fernando Alonso has pitted again for his third stop of the day, but he's running 15th now, so disappointment all round for McLaren. Eight laps to go and the gap at the front is a relatively comfortable 4 seconds. The two Williams drivers are running next to each other, unfortunately for Paddy Lowe who was hoping for points, they are down in 13th and 14th position. Massa is about a second behind Stroll, so may look for a way past for pride. Wehrlein is busy defending his seventh place from Carlos Sainz, but has a five second penalty hanging over his head. At the moment, he would still remain inside the top ten. Vettel makes a meal of overtaking backmarker Massa, who left him space for an overtake but Vettel overcooked the corner and had to have another go at it. Massa: "I think he's afraid of me." Vettel: "Why is it always Massa?" Fernando Alonso has picked up the pace again and dispatched both Williams drivers to move into 13th. Fastest lap of the race so far, Lewis Hamilton - 1:23.593. Felipe Massa does make it past his teammate Lance Stroll, and leaves the Williams far behind. Puncture for Kevin Magnussen as the Haas drops out of the points and heads into the pit lane. Disappointment! Replays show a bit of a bump with Kvyat as Magnussen tried to get past, so the puncture was slightly his own doing. Kvyat and Grosjean up into the top ten. Magnussen back out and running 14th. Vettel crosses the line 3.4 seconds behind for second place. Ricciardo a very distant third. Fantastic job by Force India for 4th and 5th, incredible points haul for them to consolidate fourth in the championship. Esteban Ocon's best finish in F1 as well, solid but quiet job this weekend. Pascal Wehrlein crossed the line seventh but will be eighth when classified, so that's Sauber's first points of the season. Turn 4 incident involving K Magnussen and D Kvyat under investigation. Tweet from @McLarenF1: Fernando finishes P12 with his fastest lap of the race: 1:23.894. Great effort from @alo_oficial after an unlucky start. Good chat between the three drivers in the green room and they take to the podium for national anthems and champagne. Vettel admits to Hamilton that he was surprised by the out and out pace of the Mercedes, and to Ricciardo says he's confused why they emerged side by side with Hamilton after his pit stop. All of that can be attributed to the Ferrari - not quite quick enough today, and a bad strategy call from the pit wall. However, Vettel still leads the championship and we go into Monaco still satisfied with having two different teams in this 2017 season long battle. Great job for Sauber to pick up their first points of the season, and disappointment (although perhaps not surprise) for Alonso to miss out on points for McLaren after such a good qualifying. He's probably already on a plane to the US, though. Toro Rosso have moved ahead of Williams in the constructor's fight, one point between the two. Williams will struggle to do battle with Toro Rosso who have two stronger drivers, whilst they are pinning most hopes on Massa. So, two weeks until the Monaco Grand Prix, and we know it won't be an overtaking frenzy, but it can still provide plenty of intrigue and excitement to add to this brilliant 2017 story.